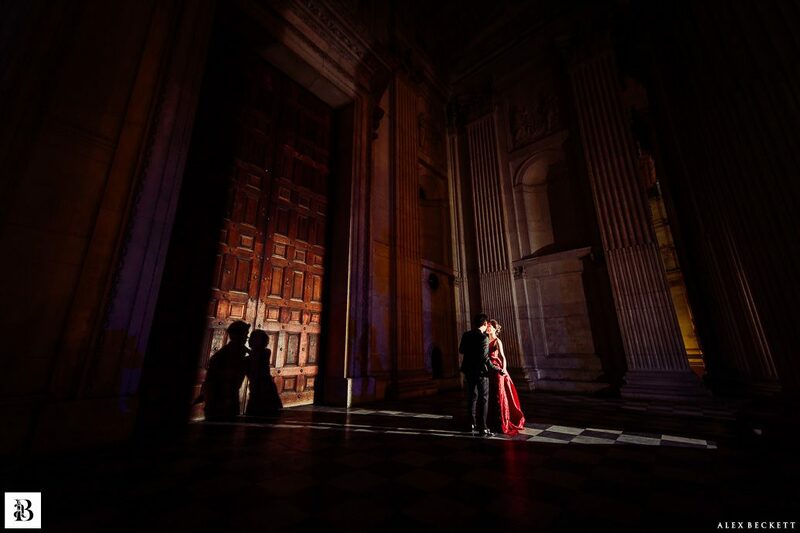 Why choose London for a Pre-Wedding shoot? So if you’re weighing up where in Europe to visit, I think London Pre-Wedding Photoshoot is a failsafe city for historic locations. You’ll find a mix of grandeur and the romance of England. Many of the buildings have a sense of timelessness. When you think that St Paul’s was being built in the 17th century, that Prince Charles and Lady Diana were married there in the 1980s – well, that’s an iconic location famous throughout the world. Plus, London is a creative hub. It’s where famous music has been made and famous films have been shot. It’s where great theatre happens every night. The other reason is the shopping. London has some of the best shopping in the world. So if you’re here to shop, consider scheduling in a pre- or post-wedding shoot. Obviously, people also come to London because they have a connection to the city. If you’ve studied in London or met in London, you’ll have lots of memories you want to share with friends and family back home. You can capture that spirit of London to show everyone at your wedding banquet. Everyone wants to shoot around Big Ben and the Houses of Parliament. There’s scaffolding on the clock tower at the moment while it’s being renovated, and that’s going to carry on for another three years. But even just by altering the angle we’ve got the rest of that beautiful building as a location. You can then walk your way – and it’s quite a walk – to the Millennium Bridge. That was the footbridge the followers of Voldemort destroyed at the beginning of the film Harry Potter and the Half-Blood Prince. You take that bridge to cross to St Paul’s Cathedral. You can do quite a lot of this route if you have a full-day shoot. For a half-day shoot, we’d cut it right down and concentrate on one side of the river. From there it’s possible to head down The Mall (the wide road that leads to Buckingham Palace and is used for royal processions). I advise my couples not to shoot at the palace; you can’t get in or do anything interesting visually. It’s a place to visit as a tourist, but not for great photographs. Instead, I like to head down to a really pretty area I know that’s typical of that part of London, with its handsome stone buildings. And nearby you have Horseguards Parade and St James’s Park and Green Park. If time allows, a quick taxi will take you to tower bridge. This, another of London most iconic structures, really comes alive at night. If you're lucky you might even see it open as a tall ship passes through. After shooting here there are lots of restaurants and it's often a good place to grab some much needed sustenance. If we go to the South side of the River Thames, we can get an iconic image shooting over the water to the Houses of Parliament. Everyone wants that shot. I’ve done a fashion shoot there for an international glossy magazine. A national television documentary even filmed me shooting there! We then walk into the area known as South Bank, which is more modern and edgy. We can do something quite different for you there so you get a great contrast in your images. We’d head past the London Eye to the Oxo Tower, which has lots of different levels and interesting angles. Every time I go there, I shoot something different. It’s unique for every couple. There are some nice views of St Paul’s in the background, too. The great thing about London is the variety, so as well as the iconic shots we can mix it up a little. We can shoot by famous architecture or in leafy parks. If you’ve lived here, you’ll want to capture the London that was important to you then: it might be the pub around the corner or the university where you met. But London is also home to some of the most iconic football teams in the world, thanks to the Premier League, and I’ve done shoots outside the Chelsea stadium, for example. We’ve also successfully liaised with the staff at the world-famous Wembley Stadium to organise a special photography event for clients who were really into their football. Basically, if you’re a fan of a particular team we can advise what is or isn’t possible. Set in 32 acres of countryside in the East End of London, with skyscrapers in the distance, we find Mudchute Farm, one of the largest inner city farms anywhere in Europe. They look after British rare breeds and take care of over 100 animals and fowl on site. We have arranged location-shooting there for couples who wanted the contrast of a background with real rural charm alongside the iconic ones. The city area is great if you’d like some edgy, skyscraper shots. We have a mini-Manhattan in the east of London that, again, provides a contrast to the classic pre-wedding locations. Alternatively, in certain, more central areas you can find ‘little London’, those narrower streets – quaint, Diagon Alley London – where we can shoot against a bank of red phone booths, for example. I’ve done that for foreign glossy magazines, as well. It’s all about route- and time-planning, so again, you need to chat through your wish list. In London, you’re never far away from a green space, so if you want to combine the iconic backgrounds with some quiet, pretty, rural shots – which also seems very English – it’s easy to do. Hyde Park and Regent’s Park are both quite central and offer boating facilities on the lakes, ideal for a full-day shoot. If you chose to visit Mudchute Farm, Queen Elizabeth Olympic Park is a great secondary destination. A beautiful legacy of the 2012 Olympic Games, it offers stunning architecture mixed with leafy tranquillity. A charming combination of canal and market, Camden Lock is cool London. The area is most famous for its world famous flea market, where you can buy arts and craft items, antiques and music memorabilia. This is where Prince once opened a shop and Amy Winehouse worked on a stall so it is famous as part of London’s counter-culture. Nearby Shoreditch – equally known as a young, hipster centre – is the site of some of the most creative and colourful graffiti images and wall art in London, which offer an energetic, vibrant background with a twist of humour. At one end of London Bridge is Borough Market, which has existed, in some form or other, for around 1,000 years. This can be a successful and different location to add to some of the more traditional backdrops, as it’s not too far away from the route plan we’ve sketched out, above. It’s where some great food is served and some great produce is sold and provides a mix of colours, delicious smells and bustling life. It’s also close to the glass needle of The Shard skyscraper. Is London Safe for a Pre-Wedding shoot? I live in London. I photograph here several times a week. I’ve never come across anything that has frightened me. London is very, very security conscious these days. But – importantly – you should look to get an experienced, preferably London-based, photographer. You need someone who knows their way around and knows how to work with the different locations and the various rules and regulations – that helps a lot. And preferably someone whose first language is English and can chat to the security guys. London is more challenging to shoot in than, say, Paris, which feels far more relaxed in terms of security. But I’ve never felt worried in either city. What are your tips for a successful London Pre-Wedding shoot? Arrange everything in advance with your photographer and have a location plan. Then, on the day, be prepared to throw a lot of it away! I aim to know which parts of the shoot are really key for my couple. Maybe there’s one location that they really want to capture because they’ve loved a previous shot of mine. Maybe a memorable moment in their love story played out in a certain place. Apart from that, you have to be really flexible. You might find you’re loving one location and want to spend more time there. Again, you need an experienced London photographer you can trust, because he or she will know where you should be at certain times of the day. Harrods during the day looks ordinary; at night it’s covered in fairy light bulbs. Some locations are at their most beautiful in the blue hour. An experienced photographer who knows the city well will be able to guide you with your route-plan. You might be surprised how late we start the shoot in summer because we want to be photographing in the best light. Basically, I know when locations are not so busy but the light is still good. There are circumstances in which I’d advise a wraparound shoot. You do a sunset shoot at certain locations, grab something nice to eat, go to bed for a few hours and then start again at sunrise when other locations are at their best. (If you can sleep in a way that preserves your make-up and touch it up yourself in the morning, you don’t even have to ask the MUA back!) That works extremely well in high summer. Can I combine London with another location? A lot of my couples choose to do a two-day shoot: half a day in London and a day outside London. I don’t usually recommend doing them on the same day because of travel time. But it’s easy to do. You’ve got Leeds Castle. You’ve got Cambridge, Oxford. You’ve got beautiful countryside in the downs or Brighton and the seaside. And don’t forget, we’re a couple of hours from Paris. It’s really easy to get on the Eurostar train and get to Paris. Down to the details: how do we get around London and where do we change outfits? We can either hire a car for an entire day or get taxis and Ubers. Hiring a car means you’ve got a mobile base for your stuff, but the problem is that we spend a lot of time waiting for the car between locations because the driver has had to park some distance away. The problem is always finding a parking space. Obviously, in London, the black cabs are big, you can fit a lot in them; also, it’s really easy to get a good Uber in London, and it’s the most cost-effective transport. As for where you change: there are a few options. You can either hire a hotel room somewhere along the route, but that means going back to the hotel between shots, which again takes time. Or there are lots of public bathrooms we can use. That’s not so glamorous but it’s quickest and easiest, and I know a selection of quite nice ones along the routes I use. How many changes of outfit should I bring? In London, for a full day shoot, three outfits for the bride is the optimum combination. Something like a nice summer dress, maybe a white wedding dress for sunset, and a long gown for the evening. We advise you not to have prints for the evening dress and always to look for dresses that are cut to have some movement. Finally, bring sensible shoes. Walking is the easiest way to get round in London, the most time effective. For shots where we do see the shoes or we want the extra height, we can quickly change you into your heels.